Defines an (Indexed) Set of data corresponding to a complete Transfer by a File Interface, i.e. File Header and Transient Entities (Objects) contained in a File. Contained Entities are identified in the Model by unique and consecutive Numbers. InterfaceModel itself is not Transient, it is intended to work on a set of Transient Data. The services offered are basic Listing and Identification operations on Transient Entities, storage of Error Reports, Copying. Moreovere, it is possible to define and use templates. These are empty Models, from which copies can be obtained in order to be filled with effective data. This allows to record standard definitions for headers, avoiding to recreate them for each sendings, and assuring customisation of produced files for a given site. A template is attached to a name. It is possible to define a template from another one (get it, edit it then record it under another name). Defines empty InterfaceModel, ready to be filled. Internal method for adding an Entity. Used by file reading (defined by each Interface) and Transfer tools. It adds the entity required to be added, not its refs : see AddWithRefs. If <anentity> is a ReportEntity, it is added to the list of Reports, its Concerned Entity (Erroneous or Corrected, else Unknown) is added to the list of Entities. That is, the ReportEntity must be created before Adding. Adds a ReportEntity as such. Returns False if the concerned entity is not recorded in the Model Else, adds it into, either the main report list or the list for semantic checks, then returns True. Adds to the Model, an Entity with all its References, as they are defined by General Services FillShared and ListImplied. Process is recursive (any sub-levels) if <level> = 0 (Default) Else, adds sub-entities until the required sub-level. Especially, if <level> = 1, adds immediate subs and that's all. Same as above, but works with the Protocol of the Model. Same as above, but works with an already created GeneralLib. Returns the recorded category number for a given entity number 0 if none was defined for this entity. Returns the check attached to an entity, designated by its Number. 0 for global check <semantic> True : recorded semantic check <semantic> False : recorded syntactic check (see ReportEntity) If no check is recorded for <num>, returns an empty Check. From a CDL Type Name, returns the Class part (package dropped) WARNING : buffered, to be immediately copied or printed. Clears the entities; uses the general service WhenDelete, in addition to the standard Memory Manager; can be redefined. Clears Model's header : specific to each norm. 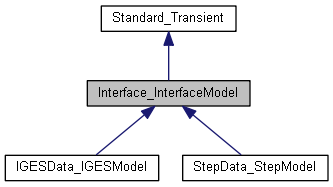 Implemented in StepData_StepModel, and IGESData_IGESModel. Erases informations about labels, if any : specific to each norm. Implemented in IGESData_IGESModel, and StepData_StepModel. Removes the ReportEntity attached to Entity <num>. Returns True if done, False if no ReportEntity was attached to <num>. Warning : the caller must assume that this clearing is meaningfull. Returns the Dispatch Status, either for get or set A Model which is produced from Dispatch may share entities with the original (according to the Protocol), hence these non-copied entities should not be deleted. Dumps Header in a short, easy to read, form, onto a Stream <level> allows to print more or less parts of the header, if necessary. 0 for basic print. Returns the State of an entity, given its number. Allows an EntityIterator to get a list of Entities. Fills the list of semantic checks. This list is computed (by CheckTool). Hence, it can be stored in the model for later queries <clear> True (D) : new list replaces <clear> False : new list is cumulated. Gets header (data specific of a defined Interface) from another InterfaceModel; called from TransferCopy. Gets contents from an EntityIterator, prepared by a Transfer tool (e.g TransferCopy). Starts from clear. Returns the GlobalCheck, which memorizes messages global to the file (not specific to an Entity), especially Header. Returns the GTool, set by SetProtocol or by SetGTool. Returns True if semantic checks have been filled. Returns true if a template is attached to a given name. Returns True if <num> identifies an Error Entity : in this case, a ReportEntity brings Fail Messages and possibly an "undefined" Content, see IsRedefinedEntity. Returns True if <num> identifies an Entity which content is redefined through a ReportEntity (i.e. with literal data only) This happens when an entity is syntactically erroneous in the way that its basic content remains empty. For more details (such as content itself), see ReportEntity. Returns True if <num> identifies a ReportEntity in the Model Hence, ReportEntity can be called. Remember that a Report Entity can be defined for an Unknown Entity, or a Corrected or Erroneous (at read time) Entity. The ReportEntity is defined before call to method AddEntity. Returns True if <num> identifies an Unknown Entity : in this case, a ReportEntity with no Check Messages designates it. Returns the complete list of names attached to template models. Returns count of contained Entities. Returns the count of DISTINCT types under which an entity may be processed. Defined by the Protocol, which gives default as 1 (dynamic Type). Returns a New Empty Model, same type as <me> (whatever its Type); called to Copy parts a Model into other ones, then followed by a call to GetFromAnother (Header) then filling with specified Entities, themselves copied. Searches a label which matches with one entity. Begins from <lastnum>+1 (default:1) and scans the entities until <NbEntities>. For the first which matches <label>, this method returns its Number. Returns 0 if nothing found Can be called recursively (labels are not specified as unique) <exact> : if True (default), exact match is required else, checks the END of entity label. This method is virtual, hence it can be redefined for a more efficient search (if exact is true). Returns the Number of an Entity in the Model if it contains it. Else returns 0. For a ReportEntity, looks at Concerned Entity. Returns the Directory entry Number of an Entity in the Model if it contains it. Else returns 0. For a ReportEntity, looks at Concerned Entity. Prints identification of a given entity in <me>, in order to be printed in a list or phrase <mode> < 0 : prints only its number <mode> = 1 : just calls PrintLabel <mode> = 0 (D) : prints its number plus '/' plus PrintLabel If <ent> == <me>, simply prints "Global" If <ent> is unknown, prints "? ?/its type". Prints label specific to each norm, for a given entity. Must only print label itself, in order to be included in a phrase. Can call the result of StringLabel, but not obliged. Prints label specific to each norm in log format, for a given entity. By default, just calls PrintLabel, can be redefined. Returns the Protocol which has been set by SetProtocol, or AddWithRefs with Protocol. Returns the list of ReportEntities which redefine data (generally, if concerned entity is "Error", a literal content is added to it : this is a "redefined entity". Replace Entity with Number=nument on other entity - "anent". Returns a ReportEntity identified by its number in the Model, or a Null Handle If <num> does not identify a ReportEntity. Returns the list of all ReportEntities, i.e. data about Entities read with Error or Warning informations (each item has to be casted to Report Entity then it can be queried for Concerned Entity, Content, Check ...) By default, returns the main reports, is <semantic> is True it returns the list for sematic checks. Does a reservation for the List of Entities (for optimized storage management). If it is not called, storage management can be less efficient. <nbent> is the expected count of Entities to store. Reverses the Numbers of the Entities, between <after> and the total count of Entities. Thus, the entities : 1,2 ... after, after+1 ... nb-1, nb become numbered as : 1,2 ... after, nb, nb-1 ... after+1 By default (after = 0) the whole list of Entities is reversed. Records a category number for an entity number Returns True when done, False if <num> is out of range. Allows to modify GlobalCheck, after getting then completing it Remark : it is SYNTACTIC check. Semantics, see FillChecks. Sets a GTool for this model, which already defines a Protocol. Sets or Replaces a ReportEntity for the Entity <num>. Returns True if Report is replaced, False if it has been replaced Warning : the caller must assume that this setting is meaningfull. Records a new template model with a name. If the name was already recorded, the corresponding template is replaced by the new one. Then, WARNING : test HasTemplate to avoid surprises. Returns a string with the label attached to a given entity. Warning : While this string may be edited on the spot, if it is a read field, the returned value must be copied before. Returns the template model attached to a name, or a Null Handle. Returns the type name of an entity, from the list of types (one or more ...) <complete> True (D) gives the complete type, else packages are removed WARNING : buffered, to be immediately copied or printed. Returns an Entity identified by its number in the Model Each sub-class of InterfaceModel can define its own method Entity to return its specific class of Entity (e.g. for VDA, VDAModel returns a VDAEntity), working by calling Value Remark : For a Reported Entity, (Erroneous, Corrected, Unknown), this method returns this Reported Entity. See ReportEntity for other questions. Minimum Semantic Global Check on data in model (header) Can only check basic Data. See also GlobalCheck from Protocol for a check which takes the Graph into account Default does nothing, can be redefined. Reimplemented in IGESData_IGESModel, and StepData_StepModel.